Having personally experienced financial difficulties during this “Great Recession,” I sympathize with John Kuzmanich’s private financial predicament and was shocked by his public exposure and humiliation in the pages of Willamette Week and disappointed that his personal matters were damaging the Oregon Tea Party brand (Jaquiss, Nigel (2013, October 16). Where’s John Kuzmanich. Willamette Week. I know firsthand that financial stress is dispiriting, it damages relationships (it is especially hard on marriages), it’s a lonely space that drains zeal, judgment and actions. When coordinating Tea Party events, the commitment burns the candle at both ends — every moment spent on activism costs family time and earnings. Initially, you can rationalize the commitment’s costs — after all, when justice and liberty are at stake, what price is too high? Eventually however, nature course corrects and personal and financial obligations come home. I found myself at this point a few short years ago — John Kuzmanich was there and grabbed the baton (and I am thankful that he was). In recent times it has been pleasing to see the inspiring work of “Citizen Journalists, Lobbyists, and Activists” — ordinary people working to give us a voice in the media and in the halls of government. The work of promoting good candidates and changing the composition of our local representation has not been as effective. I recently read that the assumed business name “Oregon Tea Party” and entity registration “Liberty Coalition PAC” at the foundation of the work to promote candidates went dangerously un-renewed and dissolved two years ago — anyone (including Tea Party opposition) could have read the same column and, for $150, registered the name with the state and used it. Fortunately, I was able to register “Oregon Tea Party LLC” and the assumed business name “Oregon Tea Party” in every Oregon county before something like that happened (McCain, Bruce (2013, October 19). Who’s Tea Party. Oregon Oracle. With the dissolution of the “Liberty Coalition PAC” the entity underlying the “Oregon Tea Party” brand ceased in October of 2011 — all accountable leadership and past actions receded into history. There has been no formal “Oregon Tea Party” entity or leadership in the State of Oregon for two years. Today, aside from the aforementioned LLC and assumed business name registrations, the only two other Tea Party-related registrations are: Oregon Tea Party State PAC, which is just a political action committee (not an entity) and John Kuzmanich’s federal “Liberty Coalition Pac DBA Oregon Tea Party” (despite the fact that the “Liberty Coalition PAC” was dissolved for failure to file and the DBA “Oregon Tea Party” failed to renew). Between the Tea Party’s birth in February 2009 and today a lot of water has passed under the bridge. In the weeks ahead a constellation of stakeholders will communicate and flesh out some reasonable expectations regarding the Oregon Tea Party LLC’s formal future. There may yet be a next chapter for a formal “Oregon Tea Party”, anchored in a board accountable to local Tea Party aligned organizations or, perhaps, there will not be any formal use of the “Oregon Tea Party” brand at all — which may be how it is supposed to be, the Tea Party belongs to everyone after all. When government intrudes too much in our private lives, people have a funny way of fighting back. In an unnamed Southern California high school, students there have begun dealing in contraband in defiance of the Michelle Obama “Let’s Move” healthy lunch program. Students have become dealers. Not in crack, meth, weed or any other illicit drug. They’ve become black market dealers in HAMBURGERS. NOW KIDS ARE LEARNING HOW MICHELLE IS HELPING THEM MAKE MONEY FOR COLLEGE—THEY ARE SMUGGLING HAMBURGERS INTO GOVERNMENT SCHOOLS, WITH THE TEACHERS KNOWLEDGE (MAYBE SOME ARE BUYING THE BURGERS) AND SELLING THE ILLICIT FOOD FOR DOUBLE THE MCDONALDS PRICE! He buys them in bulk in the early morning and has a group of carefully selected minions deal them out to students at a 200% markup. All of his cohorts have to have a GPA of 2.0 or more, because he figures they are less likely to be watched, and he cuts them in on a percentage of their sales. 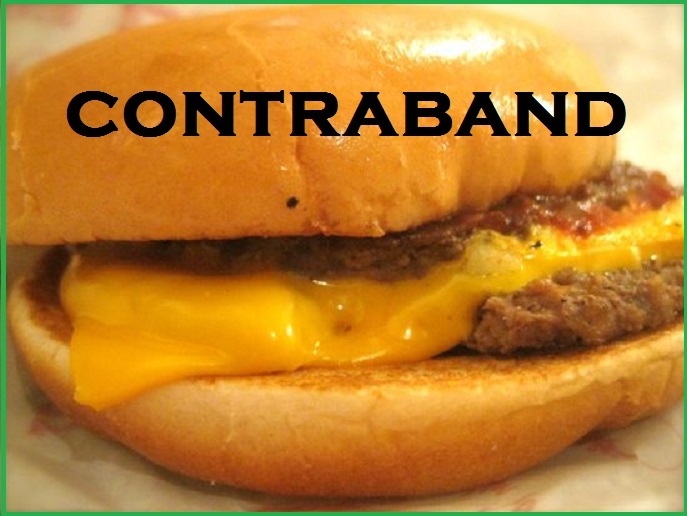 In spite of these transactions being strictly verboten, at the end of the morning there is No Burger Left Behind.